"We cannot break the laws - we can only break ourselves against the laws." This 'tour' is based on Vedic scriptures like Bhagavad-gita (BG), Bhagavata Purana (SB), Brahma-samhita (B-s), as well as other Vaisnava sources. This scheme of the universe is similar to many others known from the world folklore. For details see e.g. the chapter The Hierarchy: The Cross-Cultural Study in Michael A. Cremo - Human Devolution: a Vedic alternative to Darwin's theory. Maps 1,2,3 were drawn by Yadukulesvara Prabhu and can be found also at Wikipedia. - Sadaputa das produced Mysteries of the Sacred Universe" book and cd. Here is a short overview and a video. - Danavir Goswami produced several books on Puranic Cosmology, dvd (part 1 online) and the Vedic Cosmology website. - Gokul Candra Prabhu (BVKS) made an elaborate Goloka Chart Seminar 1/4 (en, cz). This is my home, the transcendental world of sac-cid-ananda nature (eternal, full of knowledge and full of bliss), abode of the Supreme Lord in His unlimited eternal forms. 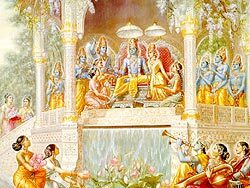 Its six divisions are called Goloka Vrindavana, Navadvipa, Mathura, Dvaraka, Ayodhya, Vaikuntha (also used as the general name of Hari-dhama). 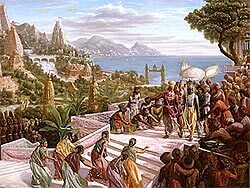 Mathura - "Sri Uddhava said: Thereafter Lord Krsna went to Mathura City with Sri Baladeva, and to please Their parents They dragged Kamsa, the leader of public enemies, down from his throne and killed him, pulling him along the ground with great strength." (SB 3.3.1) More on Mathura in Laghu-Bhagavatamrta 1.5. Lord Mahavisnu rests in the River Viraja, Causal Ocean (Karanodaka) which is the border between transcendental and material realms. The destination of sunyavadis (buddhists) is pradhana, the primordial matter, which has a sunya (void) nature. When Mahavisnu breathes out, it is manifested and transforms gradually into the prakriti, matter, the building block of the material world. 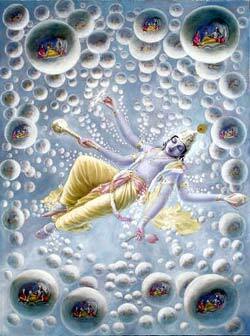 When He breathes in, it is withdrawn into His body together with the jivas absorbed in it. 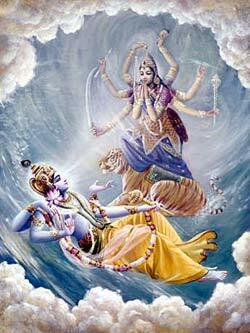 By the look of Mahavisnu I am then transferred into the womb of Durga, the material world. Realm of Lord Siva is full of Brahman effulgence. 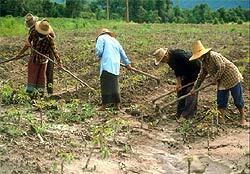 It is situated between Hari-dhama and Devi-dhama. This is the destination of the brahmavadis, impersonalistic worshipers of Siva and those who meditate on Brahman. 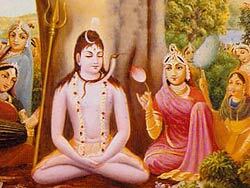 Here I can stay for a long time as Siva's associate or by his mercy reach Hari-dhama. It may also happen that I break the rules of life here and am sent back to material world. This material world is the realm of Durga who is the material energy in her personal form. I, jiva, am now just a transcendental sparkle of an atomic size and according to my desire and karma I take birth in various material bodies one after another (the cycle of birth and death, or samsara) within this world characterized by all-pervading presence of birth, death, old age and disease (janma-mrtyu-jara-vyadhi). These are symptoms of my conditioned life based on my identification with matter. 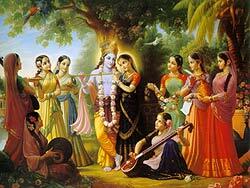 During my whole stay here I am accompanied by the Lord in His invisible form of Paramatma (Supersoul) in my heart. He lets me act according to my desires and witnesses and approves my actions. All the universes are clustered together up and down, and each and every one of them is separately sevenfold-covered. The watery portion is beyond the sevenfold coverings, and each covering is ten times more expansive than the previous covering. 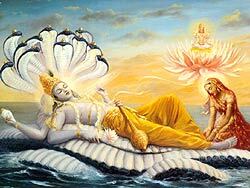 My first body is that of Brahma, the secondary creator of this world. I live on Satyaloka, the topmost dimensional level in this world. 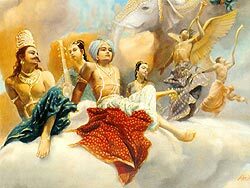 If I am a pure devotee of the Lord, at the end of my long life I will return to Hari-dhama together with my associates, great sages. Otherwise I will be born as a great sage on Muniloka. 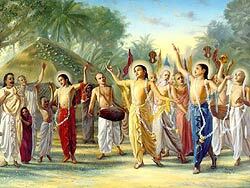 3 This is also described in the Brahma-vaivarta Purana: "They who attain the universally desired and very rare human birth, but do not take shelter of Lord Krsna, cheat themselves again and again. 4 "By wandering through 8 400 000 species of life one finally attains a human birth. Muniloka is the general name of the abodes of great sages: Tapoloka, Janaloka, Maharloka. These sages constantly meditate on the Lord. 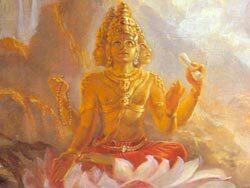 Here I'm one of the sages and by my meditation I can go either higher, up to Satyaloka, to become Brahma's associate, or down, to the level of devas (demigods). Svargaloka is the abode of demigods. I'm now Indra (the chief demigod) or one of the other demigods in a cosmic hierarchy (agnir vai devAnAm avamo viSNuH paramas, tadantareNa sarvA anyA devatA - "Agni is the lowest and Vishnu is the highest among devas. All other gods occupy positions that are in between." 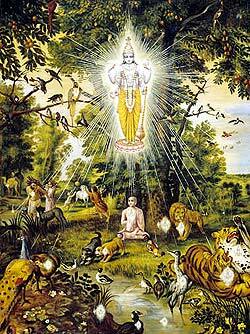 Aitareya Brahmana 1.1.1) and my duty is to manage the affairs of the universe, protecting its inhabitants against the asuras (demons) as an empowered servant of the Lord. 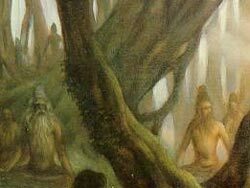 If I become advanced in my devotional service, I will be born as a sage in Muniloka. If I become attached to material enjoyment, I will degrade into a lower position becoming a semi-demigod or a human being. Bhuvarloka - the level of semi-demigods (Carana, Vidyadhara, Kinnara, Kimpurusa etc.). As one of the lesser demigods I am assisting the demigods in various ways and sometimes interacting with the humans. 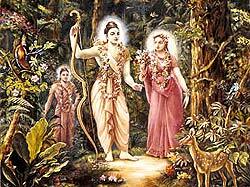 By advancement in my service I can become a demigod or to subdue to the enjoying nature and be born as a human on the earthly level, Bhurloka. Rahu is situated 10,000 yojanas below the sun. 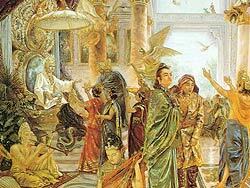 Below Rahu by another 10,000 yojanas are the planets of the Siddhas, Caranas and Vidyadharas, and below these are planets such as Yaksaloka and Raksaloka. Below these planets is the earth, and 70,000 yojanas below the earth are the lower planetary systems Bila-svarga: Atala, Vitala, Sutala, Talatala, Mahatala, Rasatala and Patala. 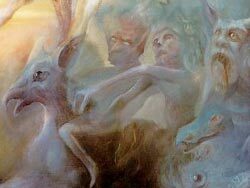 Demons and Raksasas live in these lower planetary systems with their wives and children, always engaged in sense gratification and not fearing their next births. The sunshine does not reach these planets, but they are illuminated by jewels fixed upon the hoods of snakes. Because of these shining gems there is practically no darkness. 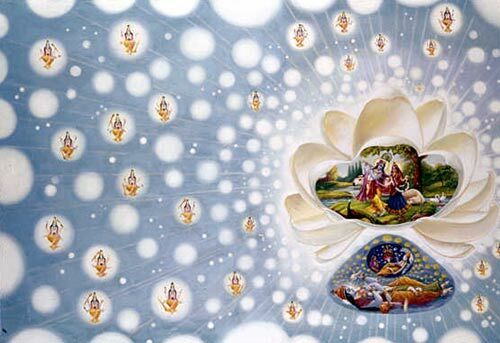 Those living in these planets do not become old or diseased, and they are not afraid of death from any cause but the time factor, the Supreme Personality of Godhead. Between Bhuvarloka and Bhurloka is antariksa, an interplanetary space where the Sun is situated. Here live beings like Raksasas, Yaksas, Pisacas and ghosts. 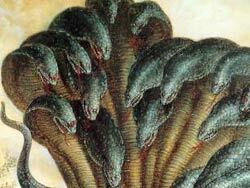 They often descend on earth and are generally inimical to humans. Usuallly they will be born later as humans. Bhurloka, or Bhu-mandala is the earthly level consisting of seven spheres (dvipas) - Jambudvipa, Plaksadvipa, Salmalidvipa, Kusadvipa, Krauncadvipa, Sakadvipa, Puskaradvipa - which are inhabited by various human beings. The planet Earth where I live now as a human being is situated within Jambudvipa. It is known as karma-bhumi (Visnu Purana 2.3.2) or karma-ksetra (Narada Pancaratra 2.2.62), the place where new karma is created, a kind of cosmic crossroad. Here I will decide about my future situation, higher or lower, by acting in a particular way (not that "all paths are the same" - yatha mata tatha pata). 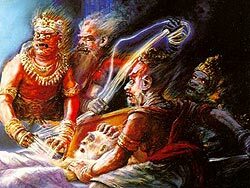 Bila-svarga is the name of subterranean 'heavens' inhabited by the asuras and the Nagas. 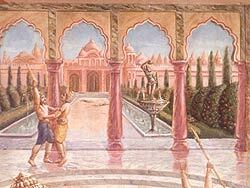 Bhagavata Purana lists seven of them, one below another: Atala, Vitala, Sutala, Talatala, Mahatala, Rasatala and Patala. 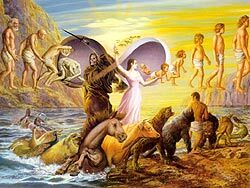 I have become one of the asuras or Nagas, half human and half serpent beings, who are enjoying high standard of material life on sub-earthly levels. I am endowed with supernatural powers, totally irreligious and usually inimical to humans. 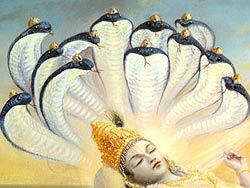 This seemingly ideal life is interrupted from time to time - I am killed by Lord's Sudarsana chakra and born as a human. 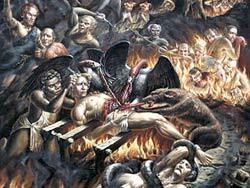 Hells (Naraka) - the lowest levels in the universe, places to suffer for committing specific vikarmas for a determined time. Yamadutas are bringing me to Yamaraja, the judge of the dead. 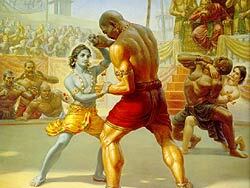 He will determine the type and length of my punishment according to dharma sastras. After my punishment is over I will be born as an animal. 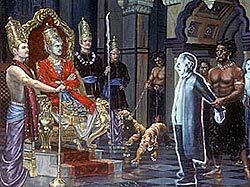 "As directed by Citragupta, he suffers in hell. Having suffered tortures there, he is born in low species. ..."